The healthcare industry is among the early adopters of virtual reality (VR). The medical sector widely uses this technology mostly for training future doctors while striving to provide students with valuable experience in practice. We have already discussed the use of VR in healthcare in our recent article Top Real-World Examples of Using Virtual Reality in Medicine. According to a report published by the Accuray Research agency, the compound annual growth rate of the worldwide virtual patient simulation market will reach the value of about 19.6% over the next 10 years and be equal around $1.49 billion in 2025. This market includes high-end mannequins that imitate human physiology in a detailed manner, robot-assisted surgical simulators, and software packages for existing VR headsets like Oculus Rift. Over the years, virtual reality has shown its real value, especially in surgery where its opportunities are hard to overestimate. In this article, we will focus on the so-called virtual reality surgery simulation that implies applying both VR software and hardware. VR surgery is a medical operation conducted on the three-dimensional virtual model of a patient through the use of VR technologies. These virtual procedures allow medical students to learn skills and get knowledge without setting real patients at risk and get clear feedback for their actions. The virtual training enables future doctors to develop confidence and gain the necessary experience. An opportunity to perform surgery on a 3D model instead of a real patient also helps them learn a new medical technique or improve previously achieved skills. With their innovative solutions, various vendors have a significant impact on the whole healthcare industry within VR surgery simulations. Let’s cover a few representative examples of medical virtual reality systems that improve the training process in hospitals and clinics. The medical training process typically implies the use of textual manuals, videos, and short-period practical courses. In some rare cases, students can have an opportunity to perform an operation on a cadaver. However, it usually takes years until trainees can apply their theoretical knowledge on practice with real patients. This puts students in a very stressful situation and creates a risk for patients since trainees don’t have enough experience. With a solution called Osso VR, orthopedic surgeons can experience being in a real operating room while having the capability to see clearly the surroundings through a VR headset and even interact with this environment using hand controllers. These controllers simulate real medical instruments and allow students to conduct virtually an operation on a patient’s leg while helping train their accuracy and improve their movement preciseness. 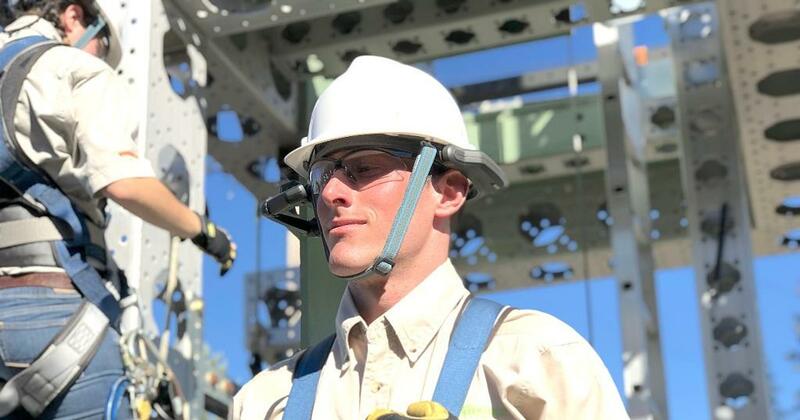 Furthermore, Osso VR has its built-in analytics system that evaluates students’ performance taking into account the time, accuracy, and other vital metrics. The main advantage of this VR solution in that it enables students to take as much time as they need to gain enough experience before conducting surgeries on real patients. It’s designed for medical specialists regardless of their level of knowledge and skills. Anyone from the first-year students to experienced orthopedic surgeons can take advantage of the Osso VR. While beginners can learn specific surgery techniques using a virtual reality system, experienced surgeons can improve their existing skills when virtually conducting complicated procedures. 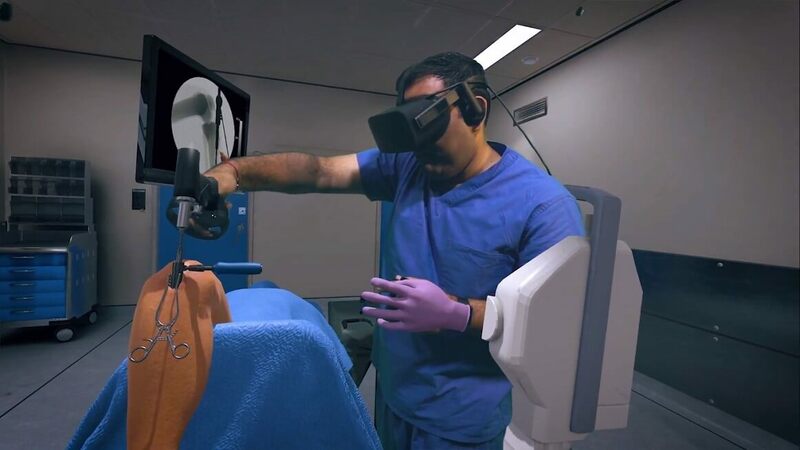 The company behind Osso VR offers a software package that creates a virtual operating room for such VR platforms as Oculus Rift/Touch and HTC Vive. Their target audience includes surgeons, medical students, as well as medical device manufacturers and their sales teams. One of the drawbacks of VR surgery simulators based on the post-operational measurements analytics is that they cannot provide medical trainees with qualified feedback in real-time. 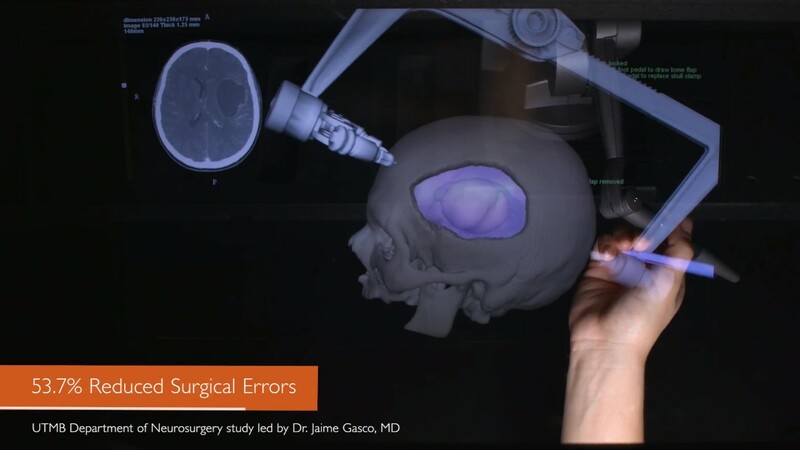 Students understand how successfully they have conducted a procedure only after they complete a virtual operation and a system generates measured metrics. Therefore, ImmersiveTouch took a step further and offered its revolutionizing solution using virtual reality. Its surgical simulators come with a special pod that allows surgeons to interact with a three-dimensional computer-generated model through haptic instruments. These instruments provide trainees with visual, tactile, force, and audio feedback on each their move. 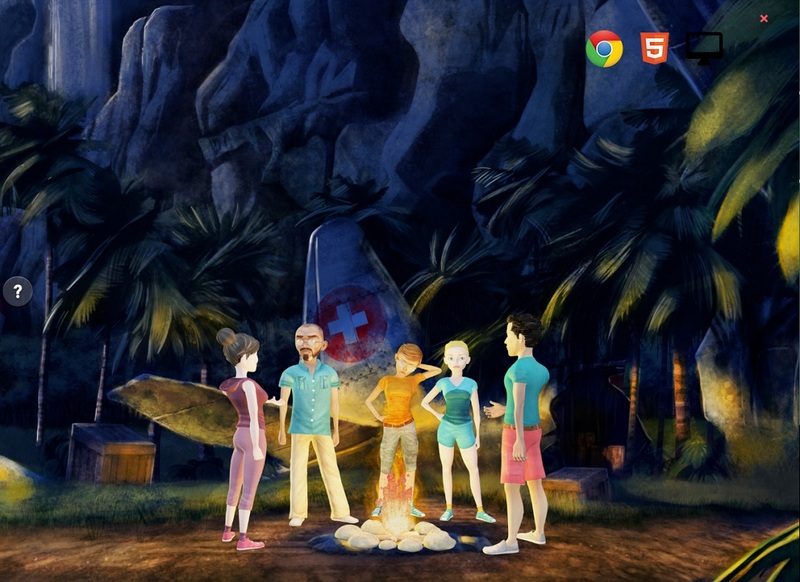 They have the high-pixel-density graphics that provide students with a realistic sense of the procedure in real time. Its solution has both head and hand tracking systems with a high-resolution stereoscopic display. Its design ensures a more comfortable work compared to typical desktops. The ImmersiveTouch system consists of specific hardware and high-performance software that offers a unified application programming Interface (API) to maintain both haptics and graphics rendering, 3D audio feedback, and interactive menus and buttons. This virtual reality solution tracks both the position and orientation of a student’s head to generate an accurate stereoscopic perspective. It ensures considerably realistic graphics from different angles of view. Furthermore, ImmersiveTouch enables students to interact with the virtual environment using both hands. They can move 3D computer-generated objects, manipulate lights, etc. Brain surgery is one of the most difficult operations in medicine where a tiny incorrect move can either kill a patient or make him disabled. Such procedures require numerous hours of practice before a surgeon will be able to work with patients. Since cadavers are a too rare resource for medical purposes, Surgical Theater created a VR-enabled solution aimed at helping young brain surgeons get more practical skills. This system uses magnetic resonance imaging (MRI) to generate detailed 3D brain models explorable on a screen. Students can virtually conduct surgery using joysticks as a means of medical instruments. The VR solution is developed in the way to simulate the results of the surgeon’s moves as realistically as possible. When increasing the pressure on a joystick while virtually pushing a blood vessel, the system visually moves this vessel in the correspondence with the applied pressure. A few existing VR surgery simulators provide multiple students with an opportunity to conduct the same operation simultaneously. But Surgical Theater can remotely connect multiple platforms thus allowing users situated anywhere on the planet to perform the same surgery together. Surgical Theater has a wide range of capabilities that include practicing various brain surgeries like removing tumors and aneurysms. Fundamental VR is another solution that focuses on providing detailed real-time feedback for medical students. This system has a haptics device that allows trainees to perform virtually various types of surgery. The virtual reality solution consists of the HoloLens headset, stylus integrated into the mechanical arm, and special software. In the headset, the stylus turns into a virtual syringe that can be emptied or refilled with a push of a button. This stylus is pressure-sensitive and varies the resistance depending on how hard users push the stylus and what kind of tissue is under operation. This ensures real-time feedback on the student’s actions and creates a feeling of working with a real human body. The UK-based company behind Fundamental VR focuses on revolutionizing the hands-on principle of surgery in VR enabling trainees to understand better how it feels to operate a real patient through a haptic feedback. The use of common video feeds during the operation often feels like an impersonal manual. 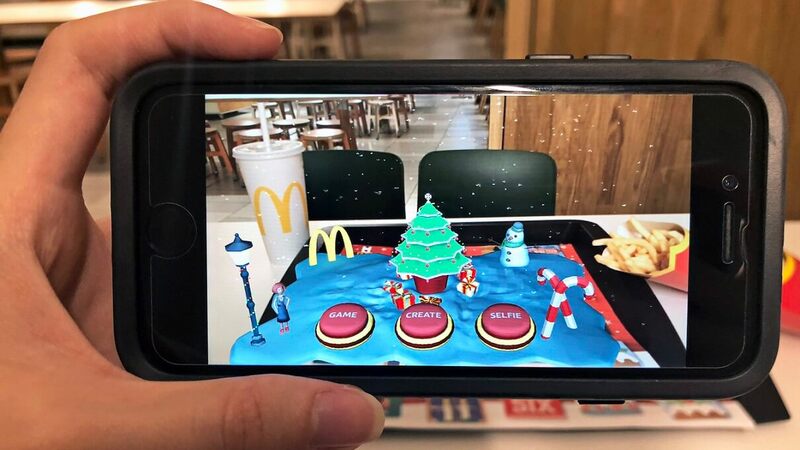 However, VR adds a 3D view that can be superimposed on the real-time video. Stanford Medicine created special software that utilizes MRI, computed tomography scan, and angiograms to generate 3D models and provide medical students with a capability to explore virtually a human skull. This VR-enabled system helps medical institutions train students, facilitates planning upcoming surgeries, and even allows educating patients before their operation. Stanford medicine has a special class where students settle into chairs and, under the dim light, virtually explore the human skull using VR headsets and three large screens. Instead of natural text-based explanations, the system displays an avatar doctor that leads trainees inside the human brain. The solution enables professors to highlight and rotate particular brain components including arteries and bones. One of the main advantages of the Stanford Medicine system is that it educates students using real patient’s brain images instead of showing computer-generated 3D models. This helps trainees efficiently prepare for working with real human tissues. VR technology has a range of benefits for the healthcare industry and surgery in particular. A recent study showed that the use of VR for surgery training could reduce both the operative time and error rate as well as increase the accuracy in comparison with traditional laparoscopic learning. 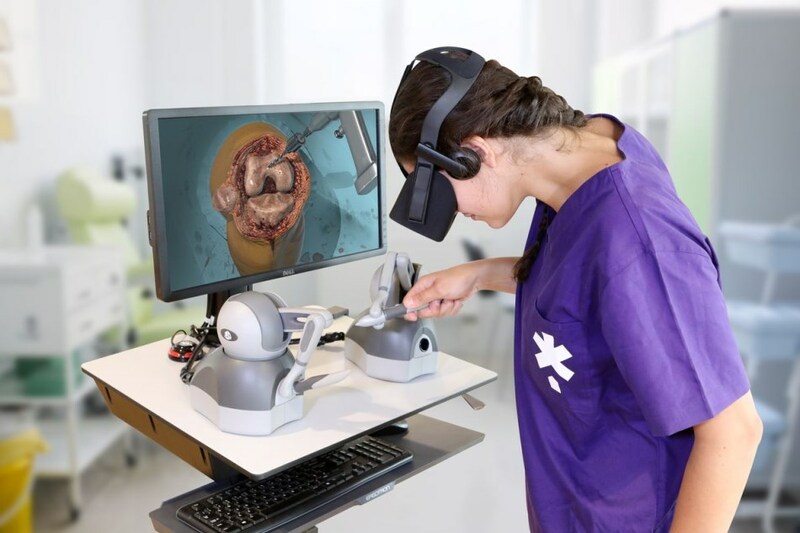 In addition, VR technology provides surgery with new opportunities that used to be unavailable with standard text-based and video training materials. The traditional methods of learning human anatomy rely on using an anatomical atlas and spending hours in dissection rooms. VR delivers a better understanding of the human body in the virtual environment and makes the training process close to real procedures. VR provides a more profound interaction with human anatomy in a brand-new way. The virtual vascular endoscopy assists surgeons in pre-operative planning by using a 360-degree video. VR also provides enhanced methods of medical training by allowing broadcasting surgeries performed by experienced specialists. Since the cost of VR hardware can remain low due to various technologies, such as Google Cardboard, we can expect more and more medical training videos from leading clinics all over the world. VR medical systems allow students to virtually participate in a particular operation and see what’s happening from the surgeon’s point of view. This helps them better prepare for future procedures and be ready for stressful and unexpected situations. In addition, video recording can assist in documenting certain surgeries and track the progress in real-time with high specification. Using VR in medicine and surgery, medical specialists can get real-time assistance from their colleagues situated anywhere in the world. Live feed and explanations will help specialists perform operations with a lower error rate and, as a result, save more lives. Remote assistance allows surgeons to share complex cases for injuries and traumas in real-time to get immediate advice. This opportunity can improve expert diagnosis and helps avoid patient transfer. The VR technology also helps patients understand what they can expect from surgery by visualizing their health problem, manipulations necessary to solve it, and planned result. For example, Crisalix, a software package for 4D/3D face and breast modeling use virtual aesthetics planning based on real patient’s measurements. Their software allows virtually demonstrate the result of the upcoming surgery for operations like breast enhancement. This improves documentation, communication, and education of clinicians resulting in improved quality of service and patient safety. With virtual reality, healthcare organizations have many great opportunities in the field of surgery. VR technology sets medical training on an extremely new top and significantly increases the quality of medical services. Emerging Innovations like Microsoft HoloLens and the growing market of VR headsets form a fertile soil for new VR applications in surgery. So, soon, we will probably become witnesses of using virtual reality for surgery as an everyday practice. Therefore, startups shouldn’t hesitate to invest their resources in the development of virtual reality solutions for the healthcare industry. With the growing virtualization trends, they will have clear opportunities to benefit from the advanced medical VR-enabled software. If you are into VR app development, you might also like our article How Schools Are Making Use of VR in Classrooms. You can always get in touch with us for professional virtual reality consultation. We will help you with your VR project and answer any related questions. We, at Jasoren, guarantee the highest quality of VR applications. Check our Projects page to see for yourself.